Warner Bros. has released a new Russian trailer for their highly-anticipated superhero adventure Wonder Woman, which is set to hit theaters nationwide June 2. This iconic character, played by Gal Gadot, made her first big screen appearance last year in Batman v Superman: Dawn of Justice. But this adventure will show fans how Diana of Themyscira became the powerful hero known as Wonder Woman. The trailer doesn't bring a ton of unseen footage, but there are a few new shots peppered throughout this explosive international sneak peek that haven't been shown before. This Russian trailer surfaced on YouTube today, coming more than a month since our last update on this long-awaited project. Back in November, star Said Taghmaoui shared new photos with himself alongside Gal Gadot, who was seen in disguise as Diana Prince, and Patty Jenkins, which may have been from the reshoots that were rumored to take place that month. There had been a report, surfacing from an anonymous open letter supposedly written by a Warner Bros.' employee, which claimed that the movie was in "trouble." Director Patty Jenkins refuted that claim, calling the letter, "made-up BS." While Batman v Superman: Dawn of Justice was quite the divisive movie for Warner Bros., faring well at the box office ($873.2 million worldwide) but getting trashed by many critics and fans, even many of the haters praised Gal Gadot's performance as one of the few bright spots for the movie. 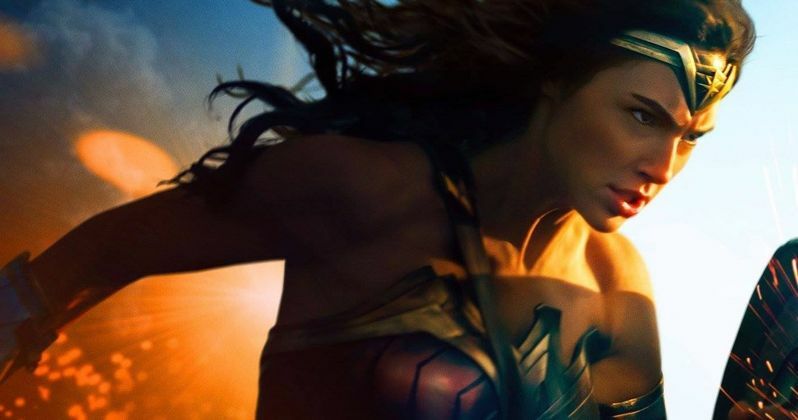 That praise could drive fans back to theaters for Wonder Woman, with Warner Bros.' president Kevin Tsujihara revealing in November that he's more confident in the DCEU after having seen Wonder Woman. If Wonder Woman fares well critically and financially, it could set the studio up for a big year, with the highly-anticipated Justice League following just a few months later on November 17. Before she was Wonder Woman, she was Diana, princess of the Amazons, trained to be an unconquerable warrior. Raised on a sheltered island paradise, when an American pilot named Steve Trevor (Chris Pine) crashes on their shores and tells of a massive conflict raging in the outside world, Diana leaves her home, convinced she can stop the threat. Fighting alongside man in a war to end all wars, Diana will discover her full powers...and her true destiny. The supporting cast includes Ewen Bremner, Robin Wright, David Thewlis, Danny Huston, Elena Anaya, Lucy Davis and Connie Nielsen. Wonder Woman is set to hit theaters on June 2, going up against 20th Century Fox's animated adventure Captain Underpants. It is also situated right in between two of Marvel's highly-anticipated summer movies, Guardians of the Galaxy Vol. 2, which kicks off the summer movie season on May 5, 2017, and Spider-Man: Homecoming, a Marvel and Sony Pictures joint production which hits theaters on July 7, 2017. That gives Wonder Woman plenty of breathing room to do some damage at the box office this summer, but it remains to be seen whether or not this DC Comics adaptation will be a big hit or one of this summer's biggest flops. Take a look at the new international trailer as we wait for more on Wonder Woman.